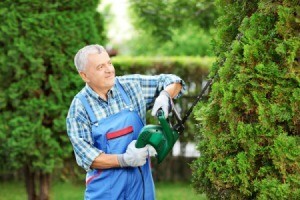 Evergreens can be used in numerous ways in your yard and garden. Keeping them pruned regularly will keep them healthy and beautiful. This is a guide about pruning evergreens. 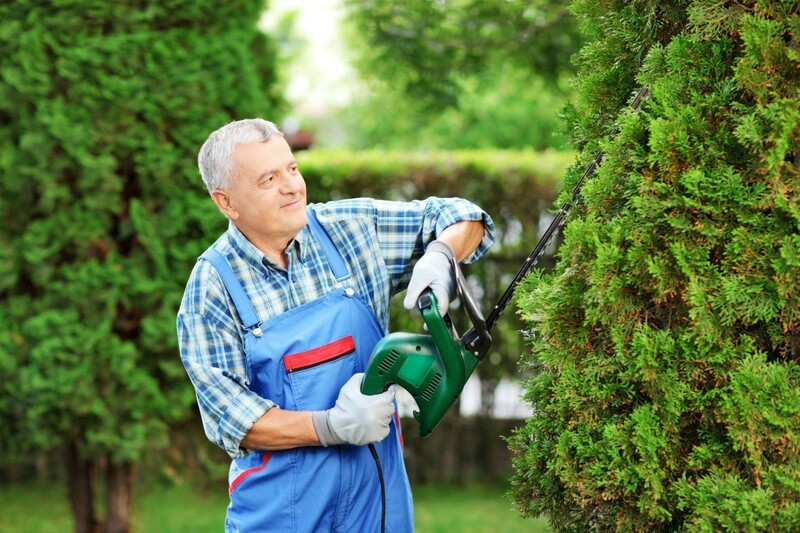 Most evergreens need little or no pruning to grow their best, but occasionally dead or damaged branches need to be removed, growth becomes excessive, or trees grow out of their natural form. In these cases, it pays to know when and how to prune your evergreens. Evergreens can be classified into two main categories: broadleaf and narrow (needle) leafed. How they are pruned depends on their growth habits. Broadleaf evergreens include species such as rhododendron, holly, and mountain laurel. These species are usually pruned every two to three years. Narrow (needle) leafed evergreens include pines, firs, hemlocks, junipers, arborvitae, yews, and spruce. Pine, spruce, and fir do not need pruning every year, where as arborvitae, juniper, and yew, all benefit from annual pruning. Evergreens without lateral buds, such as pine, spruce, and fir, have only one major growth spurt each year-usually in the late spring or early summer. The best time to prune them is from early spring to mid-June. This will help avoid excessive "bleeding" and prevent sunscald symptoms from appearing later in the winter. Evergreens with indeterminate growth (arborvitae, yew, junipers) keep growing continuously throughout the growing season and can be pruned any time through middle to late summer. In cold climates, it is best to avoid pruning in August and September. Trees respond to pruning by throwing out new growth. If pruned in late summer or early fall in cold climates, new growth may not be cold hardy, so it is best to wait until after the first good frost before pruning. One way to encourage lateral growth on narrow (needle) leafed evergreens is through a technique called shearing. This is done by removing a portion of the new "candle" each spring (the long, narrow shoots at the tips of the branches). Typically, _ to 1/3 of a "candle" is removed after the needles have fully expanded (right before the candles turn still and brown). Never prune off all of the candles on your tree. This will make it much harder for the tree to initiate a new season of growth next spring. Shearing will do little to control the overall size of the tree, but is sometimes done to control its shape. One disadvantage of this technique is that while encouraging lateral growth, it stimulates excessive surface growth resulting in dead zones in the center of the tree. If done to conifer evergreens, it should be done very minimally and only at a young age. Selective pruning, or "thinning", can be done to remove old or damaged growth, encourage renewed growth, or reduce the size of the tree without changing its natural appearance. Thinning works with the natural shape of the individual tree. First, an imaginary line called the "perimeter" line is established, which identifies where the outer surface of the tree branches will be. (Imagine a line running from the tip of the tree and down both sides to form a pyramid shape). Next, no cuts are made to the surface of the perimeter line. Instead, the line is maintained by removing the longest interior branches at a node where one branch meets another. By removing branches growing sideways and toward the interior of the tree, dormant lateral buds break and new growth is stimulated. 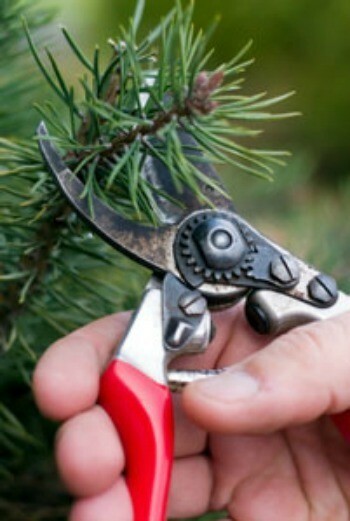 All you need to prune an evergreen is a good set of hand-held pruning shears. The best shears (making the most precise cuts) are the bypass types with blades like scissors. Make sure they can be disassembled easily for sharpening. Arborvitae: Shear anytime to shape, but do not remove more than 2-3 inches from the surface. Prune selectively to control size. Broad Leaf Evergreens (e.g. rhododendrons, azaleas, mountain laurel): Use selective pruning to control the height and size. Pinch tips to encourage lateral growth. Prune immediately after blooming. Conifers (fir, pine, spruce, hemlock): These species grow best when pruning (or candle shearing) is performed only as needed and only when the tree is young (up to 10 years old). Once the tree has reached the desired height, the central leader is removed to encourage internal growth and increase the density of its branches. Junipers: Upright juniper species require very little pruning. Spreading types require more extensive pruning (usually in layers) to maintain their size and shape. Selectively prune junipers anytime throughout the season. Avoid shearing, as junipers will not fill in bare spots very readily. Yew: Selectively prune to control size while the tree is dormant. Yews can be sheared to create a formal appearance twice per season-once following each growth spurt. 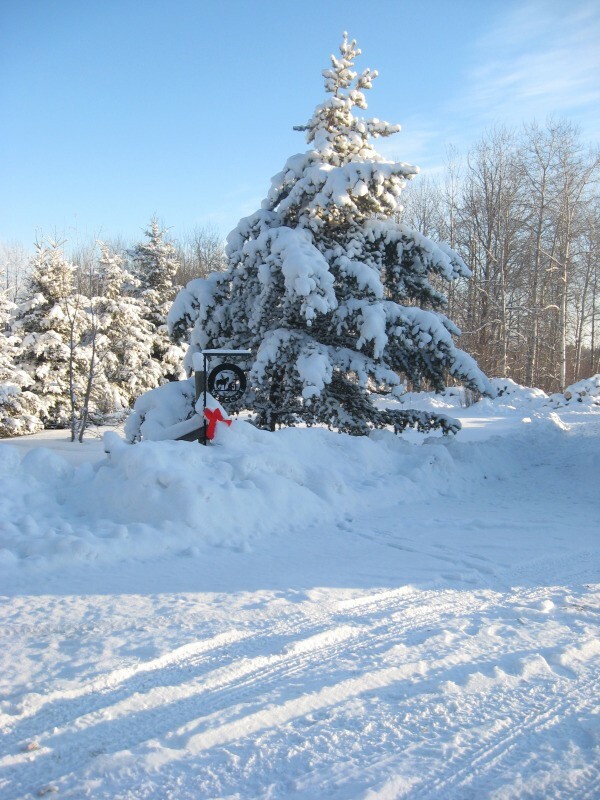 When is the best time of the year to prune mature spruce trees? They are big, healthy, and disease free. We live in northern Alberta, Canada. Thanks very much.